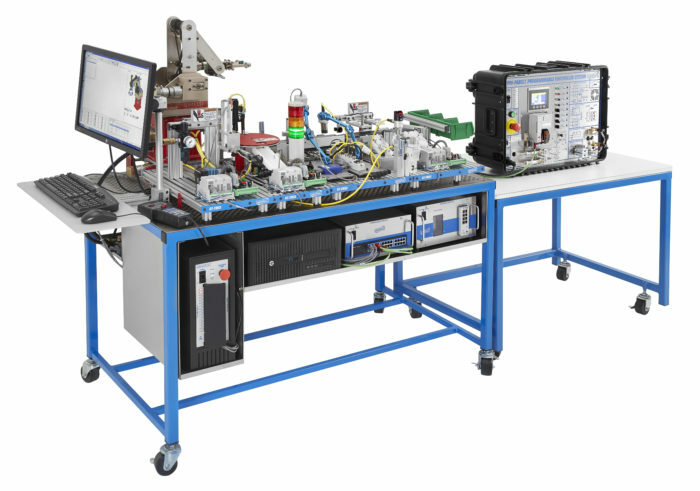 Amatrol’s Smart Factory Tabletop Mechatronics system provides an option for when training space is too limited for the full Mechatronics line, but Smart Factory training remains necessary. 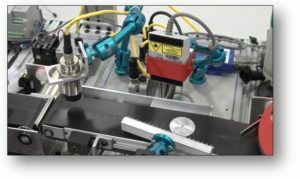 Smart Factory Tabletop Mechatronics is a fantastic option for introducing Industry 4.0 training into high schools. This five station system connects with Amatrol’s Portable PLC Troubleshooting Learning System – AB Compact Logix (990-PABCL1F), which shows performance analysis of the system via I/O Link. 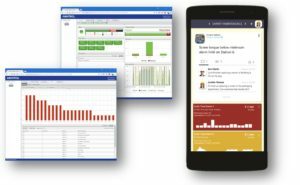 Performance analysis information includes transmitter pressure, photoeye signal strength, material type for parts passing through the system, RFID tag output, and more! This system also includes Smart Factory components for Ethernet (87-TEN), RFID/Sensors (87-TMS5), Barcode (87-TBR), and more! Tabletop Smart Factory RFID/Sensors (87-TMS5): Includes RFID, photoelectric sensor, pressure sensor, I/O link master, and conveyor to cover RFID programming and operation, pressure/vacuum sensors, and more. Tabletop Smart Factory Barcode (87-TBR1): Includes barcode reader and Ethernet-to-serial interface to cover barcode operation, scan accuracy, barcode programming, etc. Tabletop Mechatronics Smart Factory Ethernet (87-TEN): Includes a 24-port unmanaged and 8-port managed Ethernet switch to cover industrial networks, Ethernet IP addresses, network performance, managed switch Ethernet, and switch diagnostics. Tabletop Smart Factory Manufacturing Execution (87-TME): Includes manufacturing execution software that can control multiple sensors to cover order entry, scheduling, schedule status, production statistics, and alarms. Tabletop Smart Factory Visual Communications (87-TVC): Includes visual communications software for use in a mobile app to cover cloud-based data acquisition, SCADA operation, maintenance management operation, and and how to configure cloud-based SCADA and maintenance management.